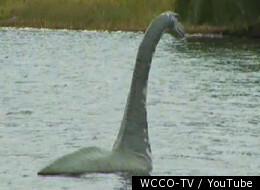 Minne, the Minneapolis lake monster, is social media-savvy and is using Twitter to make it easier for local cryptid hunters to spot her. According to local CBS affiliate WCCO-TV (via Huffington Post), the creature - first spotted in 2009 in Lake Harriet - is a 13-foot tall sculpture by artist Cameron Gainer based on the 1934 Surgeon's Photo of the Loch Ness Monster. Minne is moved to new lakes in the area for a few weeks at a time, and to drum up attendance at local parks, the Minneapolis Parks Foundation runs a "Catch Minne" promotion where Minne takes to Facebook and Twitter to post clues about where she might be. Presumably if you do catch Minne, you're not allowed to keep her. In other river serpent news, Lake Chelan, Wash., is also hosting a contest for their local Nessie. Except this one has more of an identity crisis. There have been multiple reports of a creature in the 55-mile long freshwater in the last century, but it has never been given a name. But Chelan's "name the monster" contest will change that when a winner is announced on April 28 (and we're pulling for "Cheldon," btw). That would be so fun! What a great family activity.